As a long-time resident of the South Bronx, I am wholeheartedly dedicated and invested in BUILDING A BETTER & SAFER SOUTH BRONX. That is why, as a candidate for NYS Senator, I am opposed to the Democratic Party closing Rikers Island to build a prison in our backyard, here in the South Bronx. The closing of Rikers along with the move to build a prison in our community is unacceptable. For too long, the Democratic Party has sold the people of the South Bronx down the river. The people of the South Bronx are in need of economic empowerment, employment opportunities, job training, quality education and healthcare, improved and alternative transit systems, and clean and safer parks not prisons. It is a Democratic Governor along with a Democratic Mayor, NYC Council, NYS Assembly, and NYS Senate that is pushing for a prison in our neighborhood, but these Democrats are not pushing for economic empowerment, fair housing, safer streets, better schools, cleaner and greener parks, and more employment opportunities and job training in the South Bronx. 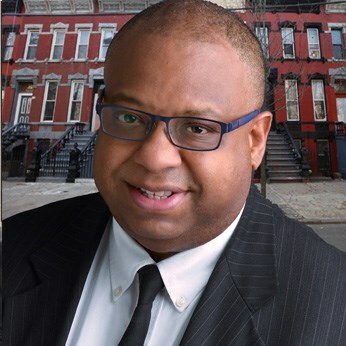 Like many of you, I find it insulting that we have a Democratic Governor and a Democratic Mayor along with a Democratic dominated NYC Council, NYS Assembly, and NYS Senate who have not fixed the poor housing conditions; inferior education; high crime rate; poverty-stricken neighborhoods; homelessness; and an antiquated transit system in New York City, especially in the South Bronx. As a matter of fact, the Democrats in New York are not willing to fix the horrible transit and public housing systems in New York - they disagree and stall on those matters as they blame each other, while you continue to suffer. However, the Democrats in New York agree to build a prison in the South Bronx. As a slap in your face, the Democratic Party is willing to spend $10.5 billion to build a prison in the South Bronx instead of BUILDING A BETTER & SAFER SOUTH BRONX by way of job creation, wealth redistribution, resource allocation, an updated transit system, fair / reasonably priced housing, and educational access and affordability. Instead of building better schools, more affordable housing, and greener parks, the Democratic Party in New York deliberately chose to build a prison in the South Bronx. Instead of supplying the people of the South Bronx with high paying jobs, the Democratic Party in New York deliberately chose to supply us with cheap labor coming from the prisons that they are building in the South Bronx. Instead of providing our youth with stronger and better educational and recreational learning facilities, the Democratic Party in New York deliberately chose to provide our youth with prisons in the South Bronx. Our children don't need to be surrounded by inmates - they need to be surrounded by doctors, nurses, health-care workers, lawyers, educators, journalists, artists, firefighters, police officers, business owners, CEOs, and other professionals in which they can imitate and emulate - that is how you empower a people and a community! There have been very few public hearings and no real news about the Democrats in New York building a prison in the South Bronx, where people live, work, play, and raise their families. Moreover, there have been no public hearings and news on the excessive amount of drug treatment centers, HIV housing, homeless shelters, and other unsuccessful initiatives of the Democratic Party that have been dumped on the South Bronx and disempowered the people of the South Bronx. On Tuesday, November 6, VOTE PATRICK DELICES FOR NYS SENATOR as I will use the NYS Senate to BUILD A BETTER & SAFER SOUTH BRONX!